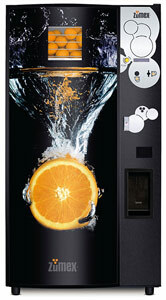 Gr Vending offers a coin mechanism and a cleaning kit for free with every sale of the Zumex vending machine for natural fruit juices. 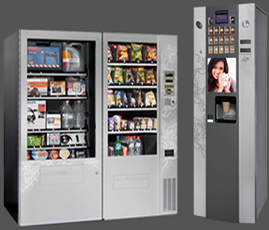 With our automatic Zumex vending machine you can offer a new healthy snack concept to your clients. Freshly squeezed juice, anywhere, 100% natural and always fresh. Because vending can also be healthy. The machine is designed to make work easier, with the refrigerated Original System squeezing system installed on rails, built-in waste bin, electronic control, information display and self-cleaning system that can be programmed by times or number of juices produced. You can configure it to squeeze and dispense the juice as you wish. The machine has two windows that show the consumer the raw material and the squeezing process.